Quentin Tarantino rides into another western with Hateful Eight and this one falls short of the storyline I was expecting. The things I didn't like, right off the bat: one was the length of the movie itself, it was too long and dragged out. I wasn't as invested as I was with Django Unchained, which had me entertained throughout. Hateful Eight failed to capture my full attention. What I did like was the musical score, the 70 mm shooting to portray that old style of filming, the carnage and how far fetched it was from being real. It's quite funny, gory, and some parts made me cringe. Action is what I'm into and I sure got that out of Hateful Eight. As seen in movie trailers there is a bounty hunter named John Ruth (Kurt Russell) set on taking his prisoner Daisy Domergue (Jennifer Jason Leigh) to hang in a town called Red Rock. He meets Major Marquis Warren (Samuel L. Jackson) along the way and also the new sheriff of Red Rock, Chris Mannix (Walton Goggins). Because a snow storm is on their tails, the group is forced to stop at a cabin called Minnie's Haberdashery to wait for the storm to pass. That's when the real story begins. In this classic murder mystery/whodunit there are alliances and rivals as well as the typical racism and foul language you expect in a Quentin Tarantino movie. 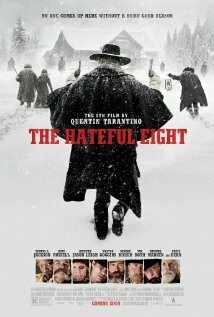 The twists and turns keep you guessing who the real enemy is but that's what defines Tarantino flicks. I won't say this is his best, but if you like him and his work then go for it, other wise just wait for the DVD/Bluray release.